dockload is a simple little MacOS X application I've written that displays a system load graph in the dock. I wrote it because I've never been satisfied with CPU Monitor that ships with OS X (you can't adjust the speed), and other system information graphers I've used (like iPulse) are too fancy for my tastes. I wanted something simple and unobtrusive that would give me an X11-style load graph integrated in the dock. dockload works by graphing the "system load average," a measurement of how busy your CPU(s) have been over the last sampling interval. The system load average is quite different from the "CPU utilization percentage" that is typically encountered. Where CPU utilization takes the total amount of cycles the CPU has been busy divided by the maximum cycles the CPU could do, the system load average tells you the number of processes that the CPU has worked on over the last time interval. The system load average is much more meaningful system utilization metric than CPU utilization on multiprocessing operating systems like MacOS X because performance as it is experienced by the user is more determined by the number of waiting processes than it is by how much work the CPU is actually doing. If a large number of processes are waiting for CPU time, then the user will experience a crawl in the system; if only one process is hogging the system at 100% CPU utilization, but that's the process that the user is using, then it's no big deal. 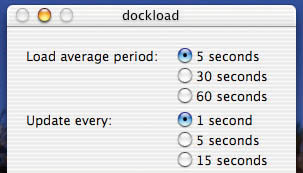 By default, dockload graphs the system load average over the last 5 second time interval. This can be adjusted to 5, 30, or 60 seconds depending on your preference. You can also adjust the refresh rate to 1, 5, or 15 seconds. Your choices are automatically saved and will be restored the next time you open dockload. To get the dockload settings window to go away, just switch to a different application. The settings window will pop up again when you select dockload in the dock. Let me know if you think this is annoying. To configure dockload to load on startup, go to System Preferences -> Login Items and add dockload to the list of applications that will open automatically when you log in.